A maintenance supervisor, and maintenance mechanic were severely injured as a result of an accident they caused while disassembling a large hydraulic cylinder. The accident occurred while they were trying to extricate the rod/gland assembly from the large cylinder. In their attempt to remove the rod/gland assembly, they pressurized the cylinder with approximately 100 PSI (6.9 bar) compressed air with the objective of pushing the gland out. This attempt failed. They figured that, in addition to applying force with compressed air, they could apply heat around the circumference of the cylinder tube, in the vicinity of the gland assembly. They thought that this would expand the cylinder to tube, and possibly release the tubes grip on the gland assembly. They used an acetylene torch with a rosebud tip to apply heat to the surface of the cylinder tube. Within minutes of their applying heat to the tube, the gland assembly unexpectedly blew out with a deafening explosion that was heard throughout the complex. The air collected the residual oil in the cylinder as it rapidly de-compressed. The air/oil mixture ignited into a fiery inferno when it contacted the torches open flame. Both men were knocked to the ground by the forces of the giant explosion. They were both covered in hydraulic oil as it sprayed out of the open end of the cylinder tube - they were both engulfed in flames. A passer-by grabbed a nearby fire extinguisher and doused the flames. The force of the heavy gland assembly ripped the maintenance supervisors leg off as the compressed air blasted it out of the cylinder. He also suffered extensive burns. The maintenance mechanic suffered extensive burns, and a broken leg. The maintenance mechanic was carrying out a routine service on a large hydraulic cylinder. The service included an inspection of the internal wear rings. In addition, there was some external leakage from the rod/gland seals. The cylinder design was typical of those found in mobile hydraulics applications. This design typically has a gland assembly that is recessed inside the open end of the cylinder tube. It is secured with a metal retaining-ring that fits into a groove that is machined around the inside diameter of the cylinder tube. After removing the retaining-ring, he tried in vain, to extricate the rod/gland assembly, All indications were, that it was seized. In one attempt, he tried to pull the rod/gland out by attaching it, via a cable, to a forklift. This attempt also failed to move the gland assembly. He discussed the problem with his maintenance supervisor, and together they decided to attempt to push the stubborn gland assembly out with compressed air. They went so far as to calculate the amount of force 100 PSI (6.9 bar) would generate against the gland area. The supervisor decided to assist the mechanic with the task. They installed a quick-disconnect fitting to the port at the closed-end of the cylinder. They connected the air-supply hose from the compressor, to the cylinder port, and pressurized the cylinder with the air. They observed the pressure on the air compressor's pressure gauge. The compressed air, and resultant force, failed to push the gland assembly out as they had planned. Upon further discussion, they decided that the cylinder tubes grasp on the gland assembly might be relinquished by using heat to expand the cylinder tube in the vicinity of the gland. Using an acetylene torch with a special tip for heating, called a rosebud, the maintenance supervisor applied heat to the cylinder tube, distributing the heat uniformly around the outside diameter of the tube. It is estimated that they were applying heat for approximately three to five minutes, when the explosion occurred. Unfortunately, the results of an industry-wide survey of heavy-duty mechanics yielded discouraging results - over 90% of the heavy-duty mechanics we spoke to have either themselves, or know of someone, who has used compressed air to extricate a rod/gland assembly. This proves, that not only is this a common practice, but also one that is regarded as "acceptable." Even companies with the most rigorous safety programs overlook this critical safety issue. Many of the people with whom we spoke about this practice, spoke anecdotally about having "blasted" a cylinder rod assembly through a door or a wall. There is no tool that is more effective, at all but eliminating work-related accidents, or all accident s for that matter, than training. Training empowers people to make safety-based decisions. This accident would not have occurred had the victims received proper training on how to disassemble a hydraulic cylinder. This is a simple, straightforward procedure for a properly trained person. Oftentimes, it is assumed that mechanics can figure out disassembly and assembly procedures. There are times when written instructions are vital, if for no other reason, than safety. 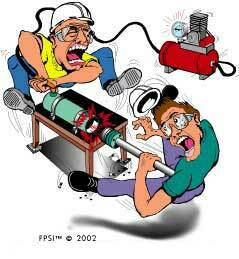 Hydraulic accidents occur on a daily basis in plants and factories around the world. However, it is apparent that only those in which a person is injured or killed are investigated. For example, a hydraulic hose-end failure is an accident. However, less than 1% of the hose-end failures that occur are ever investigated to determine the root-cause of the failure. Component and machinery manufacturers must provide clear, safety-based, accurate information that is user-friendly. The information must apply to their machinery. For example, a manufacturer might use a particular brand of pump in a machine. The information about the pump is usually a photocopy of the pump manufacturers generic information. However, the pump manufacturers' information might not apply directly to a machine. A manufacturer must state very clearly if specialized tools are needed for a particular task, and make those tools available. If specialized skills are needed to do the job, it must be stated. There are certain tools that are needed for almost any job. A hydraulics technician should have flow meters, pressure gauges, temperature gauges, and any other special tools required to service and repair hydraulics. WARNING - These are general recommendations only and might not be applicable to all situations. You must have your engineering department and service departments read these recommendations and make the necessary changes for your specific application. RMFPT, Inc. is not responsible for actions taken by untrained and/or unauthorized persons. Trained, authorized persons only, should do all hydraulic system service, repair, and troubleshooting. Step 1 - Wear safety glasses. Step 2 - Place the cylinder on a suitable table and secure it with the ports in the vertical position. Step 3 - Remove the locking device from the rod/gland assembly (refer to cylinder manufacturers information for guidance). Step 4 - Pull the rod out (if possible) all the way until it stops against the end of the cylinder. Step 5 - Place a suitable support under the rod to protect it from falling and causing possible injuries. It will also prevent it from getting damaged, when it comes out. Step 6 - Place a suitable receptacle under the cylinder (rod/gland area) to catch the oil when the rod/gland comes out. Step 7 - Plug the port in the rod-end of the cylinder with a suitable plug (proper pressure rating). Step 8 - Tilt the closed-end of the cylinder upwards slightly and place a suitable spacer (approximately one-inch) under it. Step 9 - Fill the cylinder up (through the closed-end port) with hydraulic oil. Step 10 - Connect a 3000 PSI (207 bar), manual, hand-pump, with pressure gauge, to the closed-end port. Step 11 - Gradually pump the hand-pump while observing the pressure gauge. The rod/gland assembly should begin to move. Keep on pumping until the rod/gland is pushed completely out of the cylinder tube. Step 12 - If the rod/gland assembly does not move by the time the pressure reaches the maximum pressure rating of the cylinder, suspend pumping and release the pressure. Step 13 - Call the cylinder manufacturer for guidance. WARNING - DO NOT CONTINUE GLAND REMOVAL USING TRIAL-AND-ERROR METHODS. NOTE: This procedure is recommended for occasional cylinder service and repair only. For high volume cylinder service and repair, we recommend that you consider acquiring a proper cylinder service/repair bench.